This Saturday at the Kennedy Center in Washington, DC, Norwegian solar physicist Pål Brekke will describe the Northern Lights in a literature panel at Nordic Cool 2013. His panel, The Secret Behind the Northern Lights, is 10:30 AM Saturday, March 2, 2013, in the Terrace Gallery. In this interactive session, Dr. Brekke will use photos and video footage from NASA satellites to discuss the Northern Lights. Later that day, innovative Danish lighting designer Jesper Kongshaug will recreate the effect of the Northern Lights on all four sides of the Kennedy Center's façade from 5:30 to 11 p.m.
For more information, go to the Nordic Cool 2013 website hosted by the Kennedy Center. In just 14 hours two active regions not far apart popped off numerous, relatively minor, flares (seen as bright flashes), while a pair of filaments above the Sun’s edge sent elongated steams of plasma back and forth between the two of them (Feb. 20, 2013). The filaments are suspended by magnetic forces. The close-up combination made for an intriguing video clip. The images were taken in extreme ultraviolet light of Helium. Three years ago, the Solar Dynamics Observatory was launched into orbit atop an Atlas V rocket. Here is a NASA video showing the launch and the amazing waves that rippled away from the rocket has we passed through a sundog. We were launched to "learn why our star is changing our lives." Since then we have been busy doing that. SDO data is helping us understand how the million-Kelvin corona is heated, letting us watch magnetic recombination take place, and understand how the magnetic field creates solar activity. Our data has been examined by people around the world, using the SDO websites and HelioViewer. SDO is a great mission and we look forward to the next year of spectacular data! 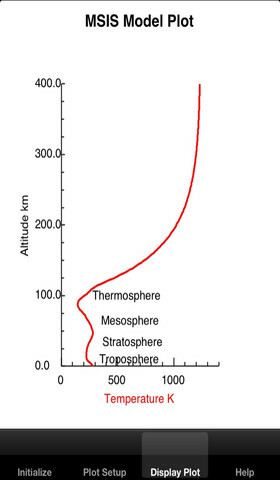 The upper atmosphere of the Earth responds very quickly to the Sun. Here is a brand-new app that lets you know what the temperature and density of the upper atmosphere is. It is the MSIS model on your phone! 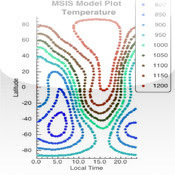 You can look up values or draw plots of the density and temperature. Here is an example of the temperature. It may be a pretty good vacuum up there, but it brings down satellites and produces the ionosphere that interferes with radio waves. Available free from the iTunes store. An explanation is available at the MSISatmos webpage. Early on Jan. 31, 2013, SDO observed a phenomenon in AIA 304 that most of us do not recall ever seeing before: a ring-shaped filament that lay flat above the Sun’s surface. Plasma streamed along the magnetic field lines in both directions along the field lines. Before long, the filament became unstable and erupted in a large swirl with most of the materials falling back into the Sun. A small filament that was behind the larger erupting filament is reveled by the eruption. The video clip in the SDO Gallery covers about eight hours of activity. You never know what you are going to see next.